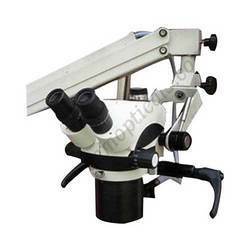 Our various models like Operating Microscope for Plastic Surgery, Table Clamp Microscope, Beam Splitter, Camera Attachment, Binocular Tube, Assistant Viewing Binocular Tube, Beam splitter attachment for CCD Digital Camera and observation tube & assistant scope etc. 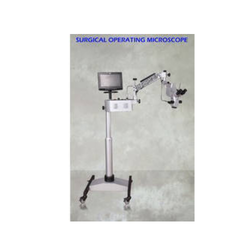 Plastic Surgical Operating Microscope (Floor Stand) offered find application in different surgical applications including in handling of neurosurgery, ophthalmic eye surgery, ENT surgery and others. With the microscopes designed to provide excellent work for handling the precision demands of surgery processes, these can be made available in different configurations as well s power options so as to suit varied application needs. These also come with manual focusing and positioning with support of 320 degree rotatable counter balanced gas spring loaded arm that assists in providing variable angle viewing. 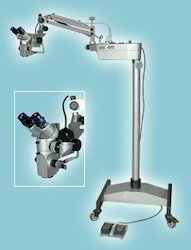 Plastic Surgical Operating Microscope offered find application in conducting different types of surgeries. These include nose, ear and throat surgery, ophthalmic eye surgery, neurosurgery and others. With the microscopes designed to provide excellent working support in involved procedures, these deliver superior accuracy in working and can be made available with different microscope sections including choice of Optical Heads, Eye Pieces, Eye Inclination, Inter-pupillary Distance. We can also offer these in different power choices as per the specific work application needs. 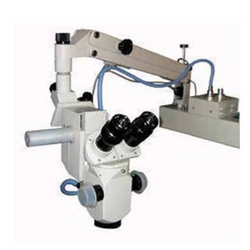 Looking for Plastic Surgery Microscopes ?